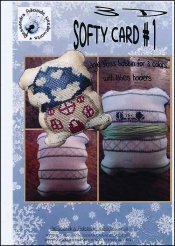 Softy Card 1 [D6924] - $17.10 : Yarn Tree, Your wholesale source for cross stitch supplies. Cross stitch pattern by Alessandra Adelaide Needleworks. Looking for a decorative thread holder?!?! Well, look no further! Alessandra Adelaide has created a large floss bobbin for 3 colors with label holders. Stitch count is 70 x 58 for each side.